When switching to Purina® Garden Recipe® Parakeet Diet it is a good idea to allow 7-10 days for the transition. 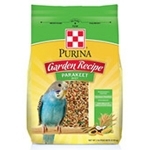 Gradually add more Purina® Garden Recipe® Parakeet Diet and less of the previous food to your bird’s dish each day until the changeover is complete. For best results discard any uneaten portion each day and clean the food dish before the next feeding. Fresh water should be available at all times. When switching to Purina® Garden Recipe® Cockatiel & Lovebird Diet, it is a good idea to allow 7-10 days for the transition. 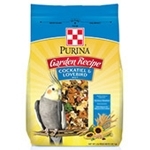 Gradually add more Purina® Garden Recipe® Cockatiel & Lovebird Diet and less of the previous food to your bird’s dish each day until the changeover is complete.